St Lawrence Primary School was designed to facilitate contemporary learning and teaching practices. St Lawrence Primary School has been designed to accommodate a wide diversity of learning styles and needs. 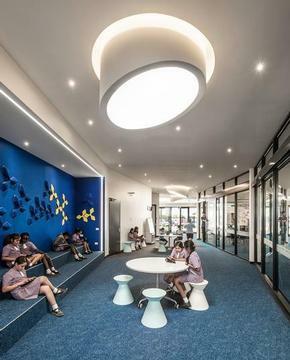 The learning spaces are adaptable and allow for opportunities for personalised learning. The design of the spaces takes account of the individual needs of students and staff. The building has small group, outdoor, whole class and shared learning spaces which give teachers and students the opportunity to teach and learn in a variety of groupings as well as in both traditional and contemporary modes. The spirit of community is enhanced by the design of the school. The school buildings are connected around a central outdoor courtyard. Each Learning Centre also contains a central common area for gathering and sharing of learning, events, prayer and worship.